Melbourne recorded its hottest ever three-day heatwave after the temperature hit 43.8 degrees Celsius (110.84 Fahrenheit), the third day above 43 Celsius. In the final days of 2008, residents of Australia's southeast might have been forgiven for thinking summer had finished early. On the island state of Tasmania in the far south, freezing gales blew, blanketing mountains with snow. In the state of Victoria, in the southeastern corner of the mainland, the number of sunny hours a day dropped from the normal 8.3 to a mere seven. "Where has our summer gone," moaned a newspaper report, while some readers commented that it made you wonder if global warming was real. In South Australia, Premier Mike Rann warned: "Everyone has a responsibility to care for the elderly and children who were the most vulnerable." He also had to explain why the state's power supply had collapsed as tens of thousands of residents turned on their air conditioning. Melbourne experienced its hottest week since the mid 1800s when temperature measurements were first taken. 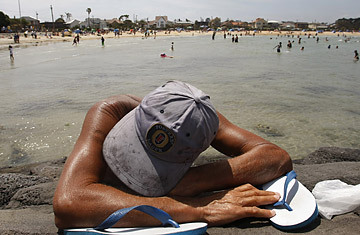 Victorian Police said that at least six people could have died from heat-related conditions. The economic cost to Victoria was expected to top $62 million. Matches at the Australian Open tennis tournament in Melbourne were delayed when organizers closed the centre court for 45 minutes. Commuter trains were thrown into chaos as lines buckled and power blackouts halted services. Victoria-based Weather Bureau meteorologist Dr Harvey Stern blamed weeks of westerly winds for blocking colder blasts of air that would normally reduce temperatures. "It's very unusual for Melbourne. The only similar heat wave was in 1908 but that wasn't as hot," he says. "It came over the hill pretty ferociously and it jumped over into the centre of town where there's a bit of bush. I wouldn't hazard a guess how big it was. They had a hell of a fight to stop it. The heat had something to do with it but we think it was deliberately lit," says the local builder. Even Australia's Prime Minister Kevin Rudd was confronted with the issue when an elderly parishioner collapsed near him on Feb. 1, during a church service in the Australian capital Canberra. In what was a dream photo op for any politician, Mr Rudd was photographed carrying the parishioner out of the church and later urged residents to "pop in and check" on their neighbors in the extreme heat. Australia's Minister for Climate Change Penny Wong told the media the heat wave was "consistent with climate change, and all of this is consistent with what scientists told us would happen." But some readers remained skeptical. "One swallow does not make a summer�a few stinking awful days doesn't mean the climate is changing either," one person emailed to the Canberra Times. It was not clear where in Australia he lived.